Today we are proud to release our Armorcrafting Content Patch. A lot of testing and tweaks have gone into this patch and I want to give special thanks to our internal testing team for helping improve the quality of this content before release en masse. Check below for all the juicy details! Item proc code updated to permit an item to cast on the wearer or the opponent. Item proc will now show it's percent chance to occur and who the target will be in the items description. Removed hunger and thirst from game. You can still eat and drink but you will no longer die from not doing so. Item proc will no longer use the last equipped items properties. Anyone can craft although you will need to be a Veteran Armorsmith in order to craft or salvage Master-level gear. Paddings and Reinforcements can be used for any gear slot for that level. Patterns are slot specific and can only be crafted or salvage from the slot type you are looking to build. You can get these components by crafting them or by salvaging them. Salvaging is a way to break down existing items into components so you can acquire higher level gear. You can salvage an item by using a Salvage Tool which is sold by Beral. Salvage Tools are not repair or rechargeable, so make sure you use those charges wisely! Salvaging an item will roll a 50% chance against each component that makes up the item. So, if an item has 6 components, you will get a 50% chance at each of those components, with a guarantee of at least one component salvaged. Reagents cannot be salvaged. Salvaging only works on items in our new crafting system. If you try to salvage something that isn't craftable you will get nothing back. You can salvage items at a lower tier (e.g. Proficient) to craft items of a higher tier (e.g. Expert) by crafting and upgrading components. The upgrade cost is 3 of a lower tier's components is equal to 1 of the higher tier's components. For example, it will take me Three Proficient Paddings to craft One Expert Padding. This is the main way where you can upgrade your gear to the next tier. There are four different Armorsmithing Tools sold by Beral, each with a cost proportional to the item you are trying to make. Armorsmithing hammers cannot be repaired and can only be used to craft items from the tier it belongs to. For example, a Familiar Armorsmithing Tool can only craft familiar level gear or components. Reagents are special items that drop off of both Open World Bosses and Dungeon Bosses. Every item (even Familiar level) requires a Reagent to be crafted. Drop rates for these items are proportional to the spawn rate of the monster who drops it and the armor level that the reagent is for. A Familiar-level reagent will drop very frequently whereas a Master-level reagent will be far more rare. For reagents that drop off open world bosses, they also drop (at a lower rate) within specific heroic dungeons as well. Is crafted armor any different than ones found in dungeons? Yes, you cannot fail to make the item as long as you have all the necessary components. What is this Mabonite and how do I get it? Mabonite is a raw component that is generated by failing to enchant items. It can also be acquired by salvaging components. If you are short on Mabonite, try salvaging a Familiar component - I hear they are rich in Mabonite! Do you still gain experience via crafting? Yes you do and, in fact, the experience you gain from crafting has been significantly increased as an incentive. Can we see a list of all the reagents and where to get them? Where's the fun in that! Is stamina still a thing? Yes you will be limited by stamina to craft just as it was in the previous crafting system. Do I need to be a Noble Citizen to craft? You do not need to be a noble citizen to craft however you will need to be a noble citizen to learn Veteran Armorcrafting which is required for Master-level gear. If this system works well for Armor then weapon crafting would follow in its footsteps shortly. 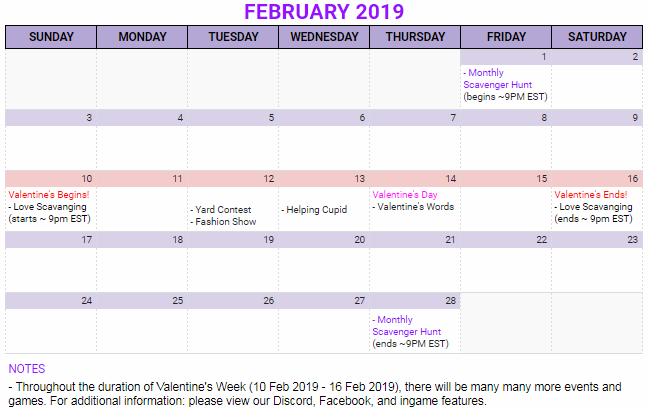 Here is a copy of the February Event Calendar, for any questions please contact event staff. Details for events will be posted on discord, and in the "General" forum.